This delightful spring tart is made in three stages. 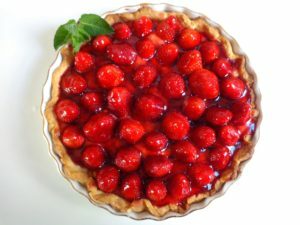 First you prepare and bake the crust (pâte sablée), then you make a French pastry cream flavored with cognac or vanilla (crème patissière), and finally you assemble the tart by spreading the cream onto the baked shell, topping with strawberries in concentric rings and adding a shiny glaze. You can prepare the tart a couple of hours ahead of serving — it will hold up in the fridge for about that long — or wait to assemble it at the last moment. Frankly I’d suggest the former, as who needs to be assembling a tart while guests are waiting for their dessert? This recipe makes a tart that will serve 6 generously. Begin by making the pâte sablée. Click here for the recipe. Select a tart pan or pie pan 8-10 inches (20-25 cm) in diameter, with or without a removable bottom. Pat the dough into your pan as evenly as possible. Spread it over the bottom, from the center to the periphery, and then pull it up against the edges, making sure it is thick enough to hold up when you slice the tart later. You can flute the top of the dough around the edges by with squeezing it between your forefingers and thumbs. Do not prick the dough. Place the tart shell in the fridge to chill for at least 30 minutes. Preheat the oven to gas mark 6 (400 F, 205 C). Line the chilled tart shell with aluminum foil and fill with the dried beans. Their weight will keep the unfilled shell from puffing up while it is baking. It doesn’t matter what type of beans you use, and you can save them for another use once they’ve cooled off after baking. Place the tart shell in the oven and bake for 25-30 minutes, until it is golden brown. Remove the shell from the oven and immediately remove the foil and beans. Allow to cool. In a medium-size saucepan, but off the heat, beat the egg yolks and sugar with a wire whisk until the mixture becomes smooth and turns a paler yellow. Whisk in the flour. In a separate saucepan, heat the milk to simmering. Do not let it boil. Pour the hot milk in a thin stream into the yolk mixture, whisking constantly. Now place the pan over medium heat and cook until it thickens to the consistency of custard, about 5 minutes. While it is heating, stir to detach any lumps that may form on the bottom of the pan. When the mixture has thickened, whisk and continue cooking for one minute more. Remove from heat, stir in the butter and cognac or vanilla, whisk again and set aside until ready to use. If you are making the pastry cream well in advance, turn it into a bowl, cover and refrigerate. Wait to assemble the tart until the baked shell and the pastry cream have cooled to room temperture. Rinse the strawberries, slice off the stems and set them on a paper towel to drain. Spoon the pastry cream into the tart shell and spread it evenly over the bottom. Place the strawberries on top in concentric circles. Heat the jelly until it liquifies into a glaze. Using a pastry brush, dab a little glaze onto each strawberry. Then spoon the rest over the cream to give it a bright red color. Refrigerate the tart until ready to serve. Serves 6 generously.